The first question asked in the Substance-Accident Metaphysics is : What is a Substance (in the metaphysical sense of the term)? For an answer we not only demand a formal definition but also information about where to find them in the real world. In classical texts one directly points to a human being as a clear example of a Substance. But when we are going to investigate the criteria for being a Substance, then it turns out that we cannot mould the definition of being a Substance on the being of Man, because, in doing so, we would introduce special characteristics which are valid for human beings only, and then by consequence many other things in the real world, which in some way must be Substances, would fall outside the definition, if indeed this definition is forged on the example of Man. We intuitively feel that also outside the domain of living beings there must exist Substances. Indeed, even a superficial examination of CRYSTALS forces us to see them (1) as individuals, (2) as in some way intrinsic wholes, and (3) as having a specific Identity. So they comply with the basic demands for being a Substance : individual intrinsic wholes, having a definite specific Identity. Because there are many different sorts of crystals, together with a multitude of strange phenomena (for instance twinned crystals, mixed crystals, left- and righthanded forms, fully asymmetric forms, and even 'forbidden' forms), and because crystals are relatively well understood (but not totally understood) with respect to their intrinsic structure, they are, according to me, well suited for playing a part in the investigation of the nature of Substance (and then by implication of Accidents). Crystals are not rare objects, they occur everywhere. Every grain of sand is a crystal (they are crystals of the mineral Quartz), and although they are worn-out because of being hustled all the time, their inner structure remains intact. Every snowflake is a crystal, and also all the frost phenomena are crystalline structures. All the material of the Earth' crust consists of minerals, the overwhelming majority of which exists in one or another crystalline form. 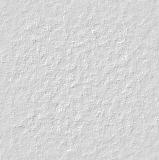 Even clay consists of very small crystals (clay minerals). Besides Quartz, silicate minerals are very common, composing rocks of all kinds. Even the high clouds are ice crystals. So crystals are almost everywhere, and this should also be one of the good reasons to include them in a study about Substance. Moreover crystals show an interesting series of analogies with living beings. And because living beings are pre-eminently Substances, crystals should also be included in the study just mentioned. What do we need to know in order to be able to correctly interpret Crystals as Substances? We will directly start to ponder about how to interpret crystals as Substances (in the metaphysical sense), and in doing so we will automatically run into a deeper consideration of their intrinsic structure . A CRYSTAL displays individuality, it encounters us as an individual being, and is as such a good example of an inorganic First Substance . Of course it is possible to interpret crystals only as being modifications of substances (as is done in Chemistry) and thus not as being Substances. In this interpretation the substance is the chemical compound (or chemical element). Accordingly we could, for example, say that Calcium Carbonate at normal temperatures finds itself in the solid state, and in this state it can occur in two (sub)states, namely either as Aragonite or as Calcite (It can even be in a non-crystalline state). Aragonite is Calcium Carbonate crystallized in the Rhombic-dipyramidal Crystal Class of the Orthorhombic Crystal System, while Calcite is Calcium Carbonate crystallized in the Hexagonal-scalenohedral Crystal Class of the Hexagonal Crystal System (Rhombohedral Division). Aragonite and Calcite would then be states (modifications) in which Calcium Carbonate (CaCO3) can be in, i.e. Calcium Carbonate can exist in two ways. But because Aragonite and Calcite differ strongly in their internal structure, which already showed up in their belonging to two different Crystal Classes and even to different Crystal Systems, it seems to me obvious that they are metaphysically different Substances (of course with a common element, namely their chemical composition). They themselves can (also) occur in different modifications, which are however accidental (= per accidens ) with respect to the internal structure : Those modified forms still possess the same internal structure, the (total) symmetry of which is described by the so-called Space Group (explained later on). Along these lines of reasoning we arrive at a new (but according to me, correct) concept of Substance with respect to chemical crystalline matter. Suppose we have (before us) a certain (individual) crystal, and suppose we ask what this crystal is (in the sense of Aristotle's what-is-it question), then we should be satisfied (for the time being) when we know the nature of its constituents, i.e. when we know which atomic species participate in the constitution of the crystal, and in what proportion, in short, the crystal's chemical composition. Remark : Later in this Essay we will answer the what-is-it question along the lines of dynamical systems theory. However, the Chemical Composition + Space Group, to be considered below (as the answer to the what-is-it question) remains the visible manifestation of the crystal's Essence. Further we should know how precisely the individual atoms (and / or ions [ Ions are electrically charged atoms or groups of atoms.]) are arranged in the crystal, i.e. we should know according to what kind of geometrical pattern the atomic constituents are ordered while building up that crystal. Knowing this complete (internal) structure is equivalent to knowing what that particular crystal is. All other features of that crystal follow in one way or another from this internal structure. The (purely) geometrical pattern of (the location of) crystal constituents is partially dependent on the nature of the atoms, their (chemical) bonds and their size (in fact their radii of influence). 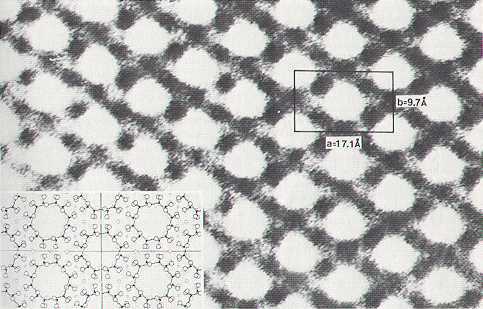 One and the same chemical composition can still admit of several different geometrical patterns. The final 'choice' of pattern (i.e. which pattern will finally be adopted by a crystal) depends on some external conditions. A very important aspect of this final atomic pattern is its symmetry. A crystal is a periodic arrangement of repeating 'motifs'. These motifs can be atoms, or ions, or certain local configurations of atoms (or / and ions). This atomic pattern can extend itself more or less indefinitely like the pattern of an old-fashioned wallpaper. In Crystallography it is considered as being indefinitely extended. Such a pattern has a certain symmetry. (a pattern which is thought to be indefinitely extended), then this pattern will be unchanged as a result of this operation, i.e. the operation maps the pattern onto itself. Also a linear shift (translation) of this pattern (again thought to be indefinitely extended) by a certain amount (in this case by the length of a small square, or a multiple thereof) results in that same pattern again. The total set of such symmetry operations, applicable to the pattern is, as has been said, the pattern's symmetry, and is mathematically described by a so-called Space Group ( For two-dimensional patterns, like the pattern just mentioned, it is called its Plane Group.). So the Space Group of a crystal describes the symmetry (content) of that crystal, and as such it describes an important aspect of that crystal's internal structure. Every crystal has a lattice structure, which means that there are (structural) units which keep repeating themselves in three (special) directions ( These special directions are compatible with the crystallographic axes connected with the Crystal System to which the crystal belongs.). When we imagine such a crystal as being indefinitely extended, then there exist some translations, i.e. executable shifting movements, proceeding along a straight line and along a certain specified distance, such that the shifting operation does not result in any change of the shifted pattern. This shifted pattern totally covers the original pattern. An analogous state of affairs we encounter in the case of old-fashioned wallpaper, where a certain motif is being repeated : When this wallpaper (also considered as being indefinitely extended) is shifted (= translated) over a certain distance the original (unshifted) pattern will be exactly covered by the new pattern, i.e. the new pattern totally coincides with the old one. To consider a crystal as indefinitely extended is legitimate, because the distances between the lattice points (which are all occupied by the building units of the crystal) are very small indeed. In the case of inorganic crystals these distances are in the order of one Angstrom (= 0.00000001 cm). A second type of translational symmetry (i.e. symmetry operation) is the screw axis. Having a screw axis means that the structure, possessing one, will cover itself completely after it has been rotated through a specified angle plus being translated (along a straight line, namely along the axis of rotation) over a specified distance. A third type of translational symmetry is the glide plane. Having a glide plane with respect to a plane m means that the structure, possessing one, will cover itself completely after it has been reflected in m plus being translated over a specified distance in a certain (translational) direction parallel to m.
But these translational symmetries which involve the movement (shift) of all the points of the structure during the symmetry operation (cover operation), are macroscopically not, just like that, visible because the translation lengths are in the order of 0.00000001 cm. But some effects of these symmetries can become macroscopically visible. For example, possession of either a righthanded screw axis or a lefthanded screw axis in the mineral Quartz, causes the occurrence of enantiomorphic crystal forms, i.e. crystals which are mirror images of each other. Figure 1. High magnification structure image of an a-b section (i.e. containing the crystallographic axes a and b ) through the mineral Cordierite. An orthorhombic unit cell is outlined and distances are given in Angstroms. The insert shows the idealized structure of Cordierite, as determined by X-ray diffraction techniques. The scales of the idealized structure and the electron transmission image are identical. Reflection in a point (= inversion). Rotation about an imaginary axis. Reflection in a point goes as follows : The point in question is the geometrical center of the crystal. When we now interchange all parts of the crystal which lie opposite to each other with respect to that point, we reflect that crystal in that point. With all these mentioned pointsymmetries (i.e. Rotation, Reflection, and Roto-inversion) combinations can be made, which themselves are again cover operations, and this results in a total of 32 unique possibilities (included the mentioned simple symmetries), i.e. 32 pointsymmetries, and in this way 32 Crystal Classes which are divided among the different Crystal Systems. Each Crystal System comprises several Crystal Classes from the total of 32 Crystal Classes, representing the 32 point symmetries. When we combine these 32 point symmetries with the mentioned translational symmetries, then this will result in exactly 230 unique combinations, and this is called the (mathematical) generation of the 230 Space Groups. To "combine the 32 point symmetries with translational symmetries" means in fact that we place motifs (for instance atomic complexes), possessing one or another point symmetry, in a translational point lattice. The motifs are then repeated in accordance with the lattice, in virtue of its inherent translational symmetry. The symmetry of the resulting pattern is then described by a Space Group. A Space Group thus is a complete description of the symmetry (the translational as well as the pointsymmetry) of an object, and in the case of crystals only 230 Space Groups are possible. Figure 2. 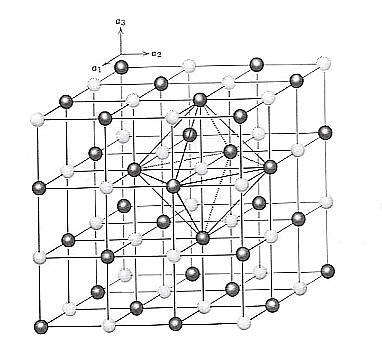 Sodium chloride (NaCl) structure based on two interpenetrating face-centered cubic lattices. Each ion is surrounded by 6 neighboring ions of opposite charge, outlining octahedral polyhedra. The point symmetries are the non-translational residues of the total crystal symmetry : Let us imagine a given crystal with all its symmetries, i.e. one or another geometric point lattice of which the points are occupied by, or associated with, chemical motifs each having a certain point symmetry. We can imagine the crystal to be a 'telescoped' structure, i.e. a structure in which no elements overlap. If we now imagine to 'telescope' this structure back, i.e. eliminating all translational distances, then equally oriented motifs will precisely overlap, resulting in one such motif. In cases where the motifs are differently oriented they will, in coming together, form a complex motif. So the result of this telescoping back of the periodic structure will be one motif, having a certain point symmetry. This point symmetry is then the point symmetry of the crystal. Having had a first introduction to crystals (given in the previous subsections), we are now in a position to deal more properly with answering Aristotle's what-is-it question with regard to any particular single crystal lying before us, i.e. we're going to deal with a crystal's ontology. By doing so we will anticipate the expositions in Part Two of this dissertation, which means that we will approach the matter in the context of dynamical systems theory. This implies that we will locate the Essence (specific whatness) of a crystal in the dynamical law (crystallization law) of that dynamical system that generated that crystal. The visible effect of this Essence is the crystal's internal structure, implied by its Chemical Composition + its Space Group. At every location where a crystal was formed, the conditions mentioned were satisfied and the relevant crystallization law started to operate. Because such a law is inherent in the interacting (mostly in the form of just aggregating) particles, and because several individual crystals were being generated, we can say that the just mentioned crystallization law is, in its active form, copied along with those crystal individuals. For our purposes it is therefore sufficient to confine ourselves in all cases to one crystal only (out of the many that are generated). In this way we can consider a crystal as an individual being that is intrinsically ONE, and thus as a First Substance. The Essence of this individual crystal is the Dynamical Law (the relevant crystallization law) that generated that crystal. This Essence or Identity abides in the 'genotypical' domain. The First Substance, with all its properties, abides in the 'phenotypical' domain (See for these concepts Part One of the Essay on Determinations ). The particular crystallization law generally is either not precisely known, or it is difficult to formulate. This relates especially to our conception of the Dynamical Law. In this conception such a law is fairly abstract (expressed with the above term genotypical ), it resides in certain aspects of the system constituents, and as such is dispersed over those constituents, i.e. one and the same Dynamical Law has its existence rooted not in a single system constituent or a single aspect of such a constituent, but in aspects of many (different) system constituents (elements). Those aspects together make up the one Dynamical Law. With regard to the Chemical Composition our exposition does not need to be very extensive. A crystal (a crystalline piece of matter) can either consist of one species of atom (one chemical element), like Diamond, or of more than one species of atom, like Common Salt (= Sodium Chloride, NaCl), it then is a crystal of a chemical compound. Even in the inorganic world these compounds can be very complex, like the many Silicates, which are among the main components of the Earth' crust. The Space Group characterizes only the symmetry of the crystal. It follows that with the Space Group the precise 3-dimensional structure is not yet fully given. This structure is co-determined by the chemical composition of the crystal (different structures can have the same symmetry). Also the dimensions, i.e. the absolute lattice point distances are determined by the chemical composition. The chemical composition thus implies structure but not exhaustively : The same chemical composition can lead to crystals having different Space Groups, so for example the above mentioned minerals Calcite and Aragonite. So if we want to specify a given crystal, then those two properties are necessary and sufficient. Calcite, this species manifests itself by the occurrence of Calcite crystal individuals. This interpretation implies that CALCIUM CARBONATE is the genus of (the species) Aragonite and Calcite. Chemical Composition : CALCIUM CARBONATE. The point symmetry of a crystal is always implied in the Space Group (notation). Also in the case of Calcite, as for all crystals, the point symmetry is implied by the Space Group (notation). In this way it thus is possible to characterize the inorganic (chemical) elements and the chemical compounds in terms of the Substance-Accident Metaphysics. The crystals, interpreted in this way, will serve us well in our effort in understanding the metaphysical state of affairs in the Real World. When (in relevant cases) the molecules (or atoms, ions and the like) do not (in such particular cases) exist in a crystalline framework, as is the case in molten material, in solutions and gaseous matter, but also in amorphous solids, then of course those molecules (or atoms, when freely existing, or ions, also when freely existing) are each for themselves a Substance (in the metaphysical sense). The gas Methane for example consists of a large number of Methane individuals, the particular Methane molecules, CH4. Along these lines we must interpret Water as a large collection of individual Substances (the water molecules), while an ice crystal can be described as ONE individual Substance. Although relatively strong attraction forces are present between the water molecules -- the so-called hydrogen bonds (quite typical for water) -- those molecules nevertheless can move freely past one another, in contrast with the case in which water, at decreased temperatures, has become ice (and thus crystalline). Because of the just mentioned attraction forces, liquid water has some sort of structure of loosely connected water molecules. But this structure is, besides being tenuous, as far as one knows, not organized, but randomized. An ice crystal is ONE Substance, because the many molecules of such a crystal are bonded to each other by the attraction forces mentioned -- the hydrogen bonds -- which now are permanent because of the absence of the intense thermical movements of the molecules. The molecules now are ordered into a specific pattern, and this pattern can be described by means of the symmetries and so by means of the Space Group. Thus in the case of ice the constituents of the crystal -- as has been found out -- are molecules, instead of atoms. Thus the transition from freely existing water molecules to an ice crystal is -- in this interpretation -- a substantial change (in the metaphysical sense, and in contradistinction to an accidental change), albeit of a special sort, because the chemical composition has not been altered, just like the case of an imagined transformation of Aragonite into Calcite. But often crystallization also directly implies the formation of a chemical compound. The freely existing constituents, for example in a solution, are connected with each other in the crystallization process. The crystal grows by apposition of the constituents, and in this process energy states play an important role with respect to the stability of the product (Everything in Nature tries to be in a state of minimum energy, which is the most stable state). With crystals and crystallization processes, all kinds of strange phenomena can take place, like substitution of constituents, twinning, distortion, change of habit, the appearance of temperature modifications etc., which offer much for the gaining of insight in the metaphysical interpretation of inorganic beings. To cite an example : The shape (the outer form) of a crystal may change, (i.e. be different) while the chemical composition and the Space Group (and by consequence the Essence of the crystal) remain identical. This shape thus is a state, a condition, in which the Substance in question can be in. Here we have to do with a genuine Accident (in the metaphysical sense). Being an Accident here means being per accidens : because that Accident (here the shape of the crystal) is not equivalent to, and not totally and exclusively dependent on, the Essence (which the fact of the Essence staying the same demonstrates). The shape of the crystal is partially dependent on certain external conditions, and together with that, on the point of time of observation. Those external conditions can be such (for example different concentrations of the crystallizing substance in the vicinity of the growing crystal) that the shape of the crystal has become strongly deformed (distorted), resulting in a shape having a deviating symmetry. This deviating symmetry is, in the case of distortion, expressed by a difference in length of equivalent crystallographic axes (or of equivalent parts of the same axis) contained within the crystal, or, said in other words : (in the case of distortion) equivalent crystal faces can be differently affected. According to the true symmetry content of the crystal (species) -- which is a reflection of the internal structure -- equivalent crystallographic axes (or equivalent parts), insofar as they are contained within the crystal boundaries, should have the same length, and equivalent faces should look the same. But still the internal structure is unaffeced by all this ( Apart from possible local dislocations in the atomic arrangement, which do often occur, but are not related to the discussed deformation of the shape of the crystal.). And because of this also the true macroscopical symmetry content is conserved (i.e. is also not affected) : If we examine such a crystal showing a deviating symmetry of its shape (a deformation), we can still detect its (having its) true macroscopical symmetry which is indicated by some physical properties which are themselves macroscopically detectable. Crystals also show a habit, which is the characteristic shape of the crystal, characteristic for the species. But although this habit (after it has been changed into another habit) not only (still) - like in distorted crystals -- shows the true macroscopical symmetry content of the crystal species, but also the one that relates to just its shape --- which in this case means : this shape is, in virtue of a change of habit, changed, it is true, but this changed shape does not involve any difference in the lengths of equivalent crystallographic axes (or of equivalent parts of them) as (they are) contained within the crystal, and equivalent faces always are equally affected . So the crystal is not distorted (See Figure 4) --- it (the habit) is not wholly intrinsic, but needs a specification of external condition : The habit of this crystal when grown under condition C (always) is : H.
So also here we have to do with a property partially dependent on external conditions, but in this case showing a stronger relationship with the crystal's internal structure (and by implication its Essence) than is the case in distorted crystal shapes. So with the habit of a crystal we have a property that is less per accidens than just deformations are. Figure 4. Two different habits (A and B) of a certain crystal species. Non-equivalent axes remain having different lengths. Equivalent parts of an axis (i.e. of any axis) remain having the same length. 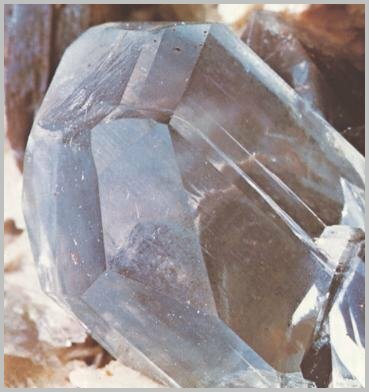 The Structure of Crystals Revisited in the "Special Series" of Essays. In that same Series the reader will find the Essay on The Morphology of Crystals which deals with, and digs a little deeper in, the macroscopic features of crystals, especially the macroscopical symmetry elements, constituting the Point Group (or Crystal Class) of the crystal.